Monica Dale, a Baltimore-based Eurhythmics teacher with a performance background in both music and dance, is on a mission to end this mind-body separation. Her classes help musicians connect with the physical aspects of music, approaching musical concepts and ideas from a movement-based perspective to enhance musicality in performance. Exploring musical concepts in a physical rather than mental way can completely transform a musician’s understanding: time, rhythm, beat, and dynamics, for example, become entirely different experiences when taken out of the standard intellectual box. Monica will be joining Summer@Eastman again this year to work with students in two different institutes. She will lead Dalcroze Level I – The Introductory Credential (a course offering basic teaching certification in Dalcroze Eurhythmics; all instruments and experience levels welcome) and will work specifically with conducting students during Choral Artistry: Conducting, Pedagogy, Musicianship. 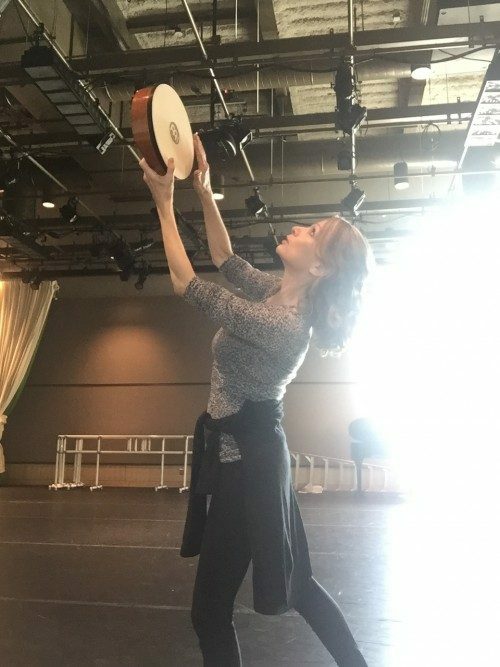 Here, she talks about Dalcroze Eurhythmics and what she plans to cover in her summer classes. Dalcroze Eurhythmics is over 100 years old, yet many people are still unclear about what it is. How did this approach first develop? Émile Jaques-Dalcroze was a professor of solfège at the Geneva Conservatory in the 1890s. He recognized that his students could write music exercises on paper correctly, but separately from sound or musical meaning. He wanted to bring music as sound into the classroom, and to lead students to listen, react and interact with it. There are several legends describing an “aha!” moment when Jaques-Dalcroze realized the importance of physical movement for musicians. However it began, he experimented and developed ways to help his students understand and perform aspects of rhythm with better accuracy and deeper musicianship. That use of movement must have seemed radical at that point. Yes, especially within a music conservatory. It still is, in many places! But several factors influenced Jaques-Dalcroze. This was a time of nationalism in Europe, where there was a kind of rivalry of new ideas. That included a “physical culture” movement with competing systems of gymnastics. Delsarte’s work was renowned, and dancers like Isadora Duncan were breaking ground. Many think of this as an approach focused on young children. Can you explain what will happen in the adult classes at Eastman this summer? Children’s applications actually followed Jaques-Dalcroze’s work with conservatory students. Since it’s a process of music education, though, it’s often categorized with methods like Orff, Kodaly, and Suzuki. In Eastman’s Choral Artistry institute, conductors approach music physically in order to discover new insights about music and its performance. Issues such as momentum, weight, breath and resistance connect with phrase, meter, rhythm and dynamics, for instance, and we link that with conducting. The Dalcroze Level I program is based on a set of standards, but with plenty of room to focus on the individuals who attend. There can be a band director and a preschool music teacher and a professional percussionist in the same class. My goal is to help each person create useful connections to their own work, in their own disciplines. In both classes, it’s really about linking sensory experiences to dig into music concepts and get fresh perspective on familiar ground. The Dalcroze institute goes further into Jaques-Dalcroze methodology and skills. Talk a little more about the Level I Dalcroze Institute. Sure – it’s pretty exciting! This is part of a new initiative of the Dalcroze Society of America. I’ve been part of a committee to standardize a Dalcroze Certificate curriculum with a three-level structure, and the Eastman program is one of the first in the new design. Level I is called the “Introductory Credential,” but it’s pretty comprehensive as an introduction – two intensive weeks in all branches of the method, presenting lots of techniques, skills and ideas people can apply in their own work, whether teaching or performing. We link up with the Choral Artistry course in the second week, when the conductors’ classes serve as demonstrations of Dalcroze teaching techniques and lesson design. Can you tell us how Eurhythmics can benefit advanced musicians who can already keep a steady beat (or think they can!)? It’s interesting – sometimes it’s the musicians who begin with the idea that they don’t need Eurhythmics who need it most! Even “keeping a beat” is a complex equation in terms of movement. For musicians to experience “beat” as a spatial concept can be a revelation! It goes beyond accuracy, though – the goal isn’t to make us metronomes. It’s more to help us tap into the physical reality of being human. That’s where music comes from in the first place. What are some of the specific musical topics that you deal with in these summer choral institutes at Eastman? I try to relate the content to the literature the conductors are working with through the week. Some concepts apply universally — the phrase through time as movement with direction, or meter as a physical phenomenon related to conducting patterns. We might also experience movement as simple and compound beats, polyrhythms, syncopation and changing meters, for instance. You’ve used the word “exercises.” What do these look like? For example, coordination exercises might involve students clapping one rhythm and stepping another. Quick-reaction exercises might call on students to switch the rhythms of steps and claps on signal. Improvisation exercises go to spontaneous creativity and tap into musical imagination. Small-group exercises combine individual creativity into a collaborative whole. What are some of the changes that you have seen take place with these conductors in the course of the week? The biggest change happens when conductors make the connection between sound and space, and allow themselves to really move. Some people respond to the ideas immediately, recognizing something they’d sensed intuitively but hadn’t quite defined or conceptualized before. Others may feel unsure or even insecure at the outset. I like to approach it as play, in a group. As people relax, they focus on the challenges at hand, and gradually make the connections. At the end of each class, we reflect on the connections to music in general and to conducting specifically. It’s fascinating to hear the conductors share their experiences of the class, spark each others’ ideas and relate the work to their conducting. How might conductors prepare for a week combining Eurhythmics and conducting? They are free to email me with questions! Jaques-Dalcroze’s texts, and many of his scores, are available on IMSLP. I have some specific analyses on my website (“Ideas to Try” – musikinesis.com), and other information is available on the Dalcroze Society of America’s site (dalcrozeusa.org). Monica Dale will teach Dalcroze Eurhythmics at two institute programs this summer: Dalcroze Level I – The Introductory Credential (July 3-14) and Choral Artistry: Conducting, Pedagogy, Musicianship (July 10-14). Visit summer.esm.rochester.edu for details and registration information.